You are welcome to bring your own anything: food & drinks of any sort. We have glasses and plates aboard for drinks and meals. I have a small onboard refrigerator that can also freeze, so unless you have a whole bunch of stuff, no need to bring a cooler.​ If you need ice, bring it or let us know, typically, I keep the fridge above freezing, but it can quickly chill. I typically don't keep ice, unless I know we will need it. People often want a windbreaker or a warmer layer on the water, it can be pleasantly cool. After sunsets, it can cool quickly, especially early and late in the season. I have lap blankets for a cozy finish to the trip. A sunhat, sunscreen, or whatever other sun protection you require is always good. If the day has a chance of sprinkles, a raincoat can be useful, though most of the time I can avoid rain, and if need be, it is dry in the cabin, the "Downpour Lounge." I also have spare coats and warm layers aboard. We have a toilet (head) aboard as well there is a public restroom at the public parking lot and the head of our road. ​There is also a stove aboard for coffee and/or tea or whatever else. We have a tank of water, and typically, some bottled water available. Musical instruments are welcome; the rustle of sails and the bow splash of a fine wooden boat like Bufflehead goes well with music. We do have a guitar onboard. Please look at the Directions page and Parking Instructions, because it'll make it easier for you. No trees in the ocean, so bring your own shade: Sunglasses, sunhat and sunscreen are always good to have on hand for travel adventures. Maine's beauty lasts, but memories can fade; don't forget your camera. I can help where a selfie-stick can't! Wine and Spirits are welcome. I can help you serve them to enjoy and commemorate your time aboard. We can cater for you; serving picnics, sandwiches, cheese platters - all the way up to complete island lobster bakes. Contact us to arrange catering, reservations, special timing, occasions, locales or pricing. We can arrange food from local restaurants, purchased to go, and served proper to you aboard, or we can help recommend reservations to eat after. Bufflehead has hosted folks for anniversaries, proposals, honeymoons, scatterings of ashes, birthdays, parties, reunions. We make the everyday special and special occasions extraordinary. Let me know how I can help, I'm honored to be a part of your life. Our own homemade Blueberry pie - made from the finest plump Maine blueberries - on return from a lobster bake feast, is a delicious way to cap a great day. Strawberry Rhubarb Pie in early season is maybe even better, or late summer fresh strawberry shortcake. For island picnics, we can lay out a nice picnic blanket for a meal on the beach, or find a cozy spot in the shade and settle in the soft grass, or just sun ourselves on rocks to see why the seals love it so much. We can serve up a delicious array of cheeses to nosh on while we sail. Feel free to bring wines to partner with our spreads. We've got some glasses aboard, and I can open and serve your pairing choice. We'll see that Silas doesn't eat them all if he's aboard! He likes cheese too. We partner with the magnificent wood-fired Cafe Miranda and can dish up your to-go order on the boat. They serve dinner starting at 5, and lunch 11:30-2, 7 days a week, also Rockland's finest Sunday Brunch, 10:30-2, funky classic inside and a sweet patio with a shade and a fireplace. Cafe Miranda Menu is huge and everything is good. Atlantic Baking Company has great ready made sandwiches, cookies, breads, coffee, etc. Maine Street Markets is a downtown gourmet market with awesome daily homemade hot lunch options as well as some pre-made and made to order sandwiches and prepared foods as well as smoothies and softserve ice cream. The Good Tern Natural Food Co-Op is great. Local farm fresh produce, sandwiches and treats as well as a full selection of organic produce and bulk grocery supplies. Member owned and operated for many years. They're on Rte 1 just N of downtown. Claws, located across the street on the water side is a great seafood place. Outside tables, some shaded, some enclosed, with a nice water view, and fantastic food. Run by a fishing family. Good bread, cheese, and some prepared foods. Maine Street Meats in Rockport has a lot of good cheeses, meats, and picnic basket essentials as well. Pizza & Sail specials will be held Thursdays with the Uproot Pie Co (whose wood-fired-oven-on-a-trailer I helped build) at the Rockland Farmer's Market, 9am-1pm. 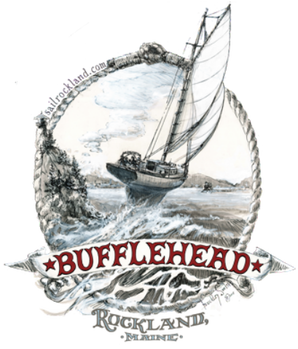 What's it like to sail on Bufflehead? This interactive map indicates Hurricane Island, our lovely picnic spot. Informative tours of Rockland's working waterfront, as short as an hour, even one-way along the waterfront & walk back. We sail out to the islands, one-way even, and at night. Heading to an event, too late for the ferry? We can carry you safely home across the bay. We can transport you from one end of town to the other, or out to the breakwater where you can walk, and be picked up again, to be returned to town. Leave a car somewhere and we'll take you there, see more in less time. Sail to the lighthouse, walk the mile long breakwater & catch a $5 cab back to town. Small company trips, group excursions, take your visiting friends or family out on the bay. Have a vacation day as a local. Sail to a lobster bake in the Muscle Ridges, out to High Island for a stroll and a swim, or we can land on Birch Island and relax & stroll on the beach. Sail out to Hurricane Island for a hike, to North Haven for a jaunt around town, or to Perry's Creek for a hike in the four hundred acre nature preserve. We can meet you at your dock, and take you, your friends or family sailing! We can also sail your guests to your island home for their visit. Be delivered to your summer home's dock in style. Just as the early "Rusticators" came by train or steamboat to Rockland and had their caretaker sail their boat, meet them, and take them to their summer house, so may you or your friends arrive or depart from anywhere on the water. Think of us as a 19th century sailing water taxi, but with a quiet reliable diesel engine in case of calm. Day and Overnight Charters can also be arranged from/to/at surrounding ports from Port Clyde to Belfast, Brooklin and Stonington, Isleboro, North Haven and Vinalhaven as one ways or special events at your location. Sail and stay trips with local island B & B's and hotels offer adventure and deluxe accommodation. Delivery or pick up from anywhere in the Fox Islands or Muscle Ridge is readily accomplished. Rates for one way charters are higher, but reasonable, I am often traveling these waters, between friends on offshore islands, my mother up on Deer Isle, and homebase in Rockland. Summer 2010 I sailed Bufflehead to Nova Scotia with my 2 year old daughter and her mom. We try to use the flexibility we have, as just us running our own boat, to give you Custom Service with Bufflehead Sailing Charters.